There were only wavelets curling seawater on the open sea. As they get more and more to the coast, seagulls begin to fly over it and hungry shark fins jagged its calm surface. Sometimes some bold swimmers dare to enter these waters, strays into this region not knowing, what may he come across. This event usually is not funny. It is often mentioned in some horror and thriller movies, when you get shivering down the spine. Only the idea of such adventure is dreadful. 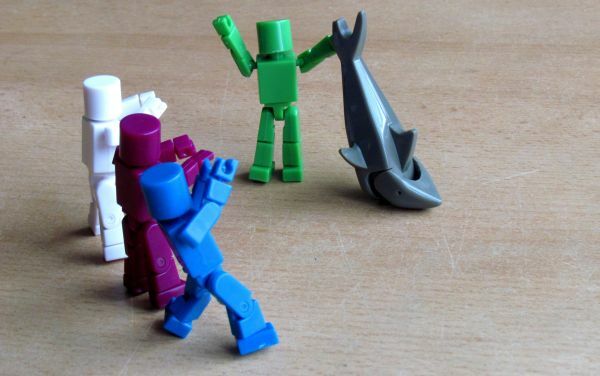 But if you grab this subject well, it can also be great fun (when you are not in the water with the shark, of course). And of this possibility was probably aware Dave Chalker, in his new simple card game named Get Bit. 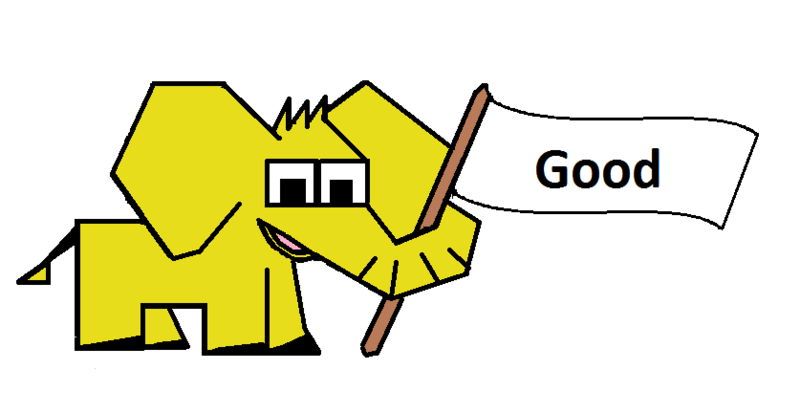 It is a game, that definitely should not be taken too seriously, and you should not play with ethical issues. That is also the reason, that miniatures in this game have no face. 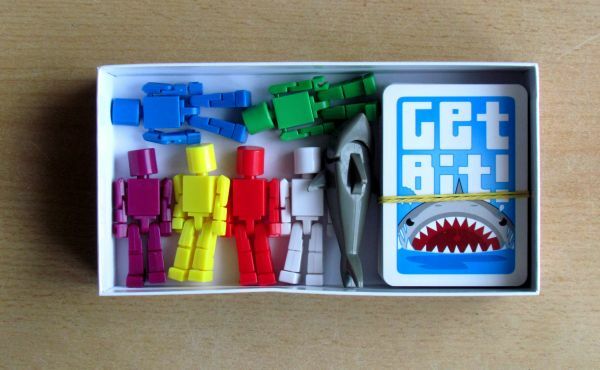 Get Bit is found in a long box, decorated with cheerful white and light blue colors. 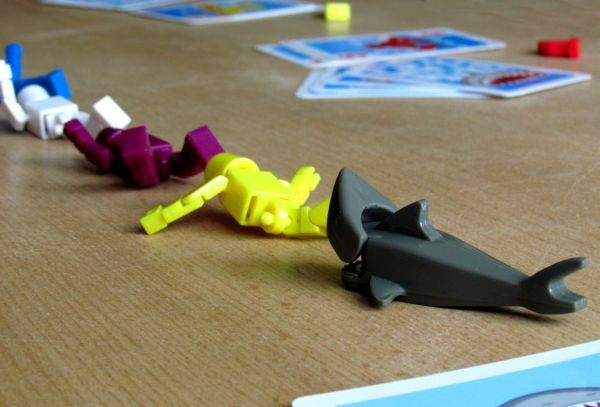 The picture on it will not leave you in doubt for even a second, when it comes to the topic of the game: swimmers escaping from the grim jaws. Inside this little box there are interesting components hidden. 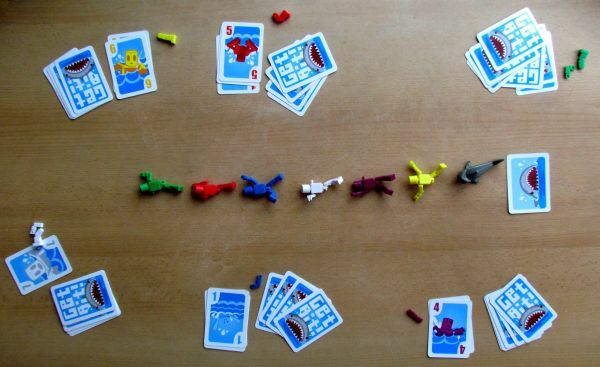 The main set is clearly a deck of cards consisting of six sets of different colors – red, green, blue, white, yellow and violet. 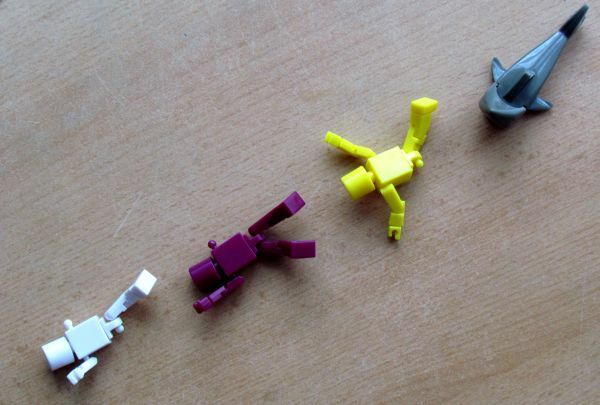 And in the same colors, you will find also the other component – six miniatures. Their every limb is demountable into several parts. You can try to be the hero and chop off the header. It is the whole head that is interesting on the miniature. It does not have any face, it’s just a nameless cylinder, which will thus not grow to your heart. It has no eyes, ears or mouth, and is reminiscent of human body only by proportions. 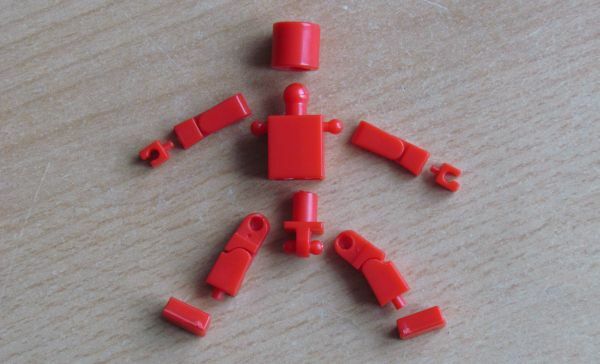 We can think of them as a kind of dummies, that are used in crash tests. Here, too, they are waiting for a sudden danger. 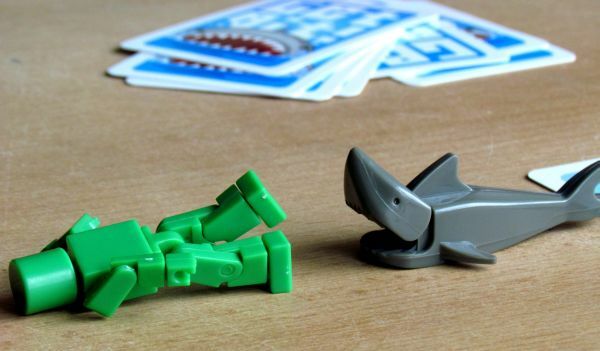 The last piece in a box is a jagged shark that can not be disassembled. The length is about the same as the dummy, but the swimmers are still in really great danger. 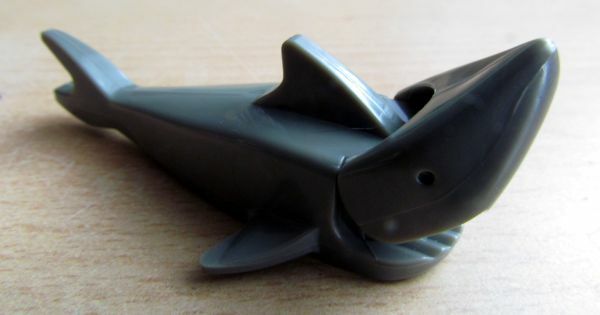 Sharks body has gray color. The content of the box is concluded only with rules. 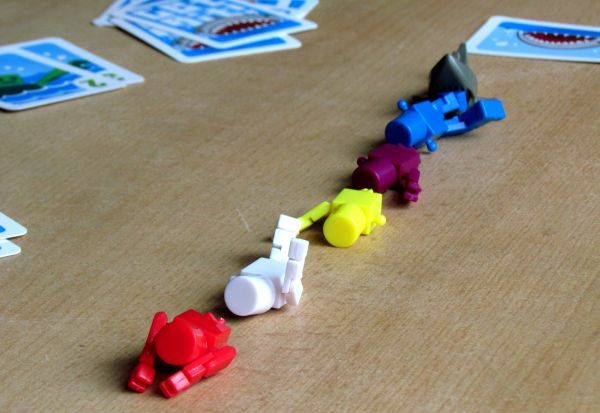 With them, you will quickly and easily learn to play Get Bit, including other variants, supporting memory or strategy. Besides, many of your properties will quickly improve by themselves in the face of this jagged enemy. 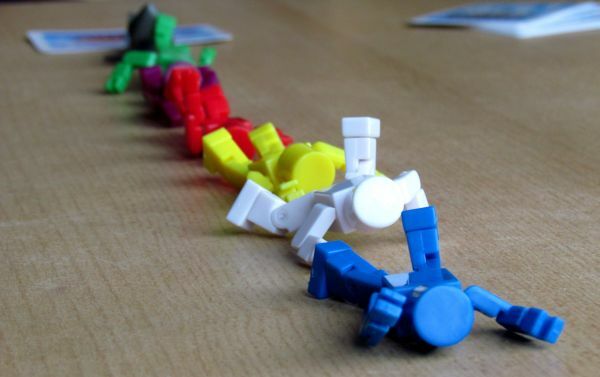 Preparation of the whole game is very simple – each of your opponents takes one miniature of his favourite color (the other differences between them do not count!). And he also picks up relevant deck of cards numbered from one to seven. These determine the speed, at which the swimming figure moves and thus a chance, that it loses one of its limbs during that round. His meat ends up in the jagged maw of hungry monster. But yet, we are still at the start and the shark has still to arise to the surface. Boys enjoy a swim and compete for the best. 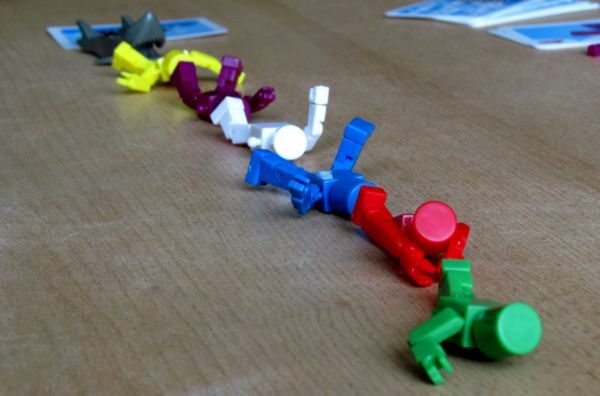 It is therefore necessary to determine the starting order in the game, that may seem to be decisive, but do not worry. 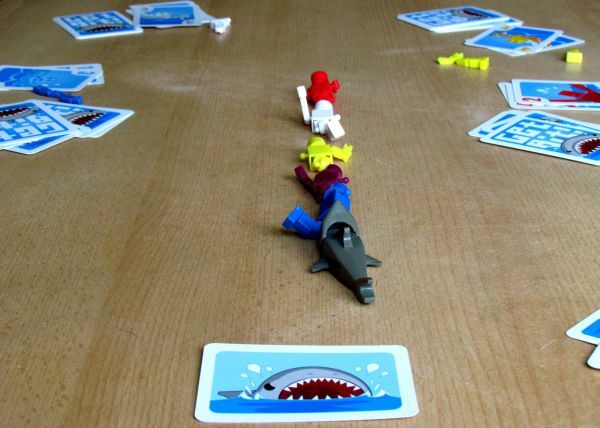 In the first round, the toothed one does not attack at all, only swimmers must catch up and get ready for the feast. 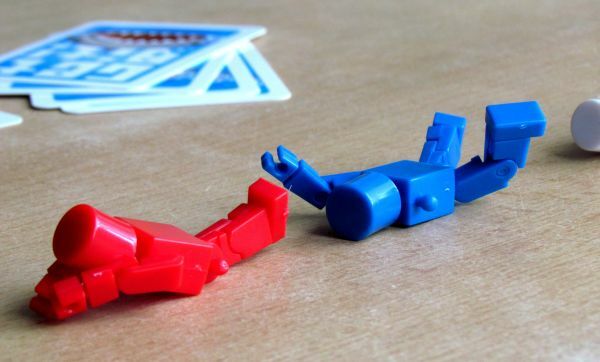 However, a starting position must be decided in some way (random draw cards, or limbs). 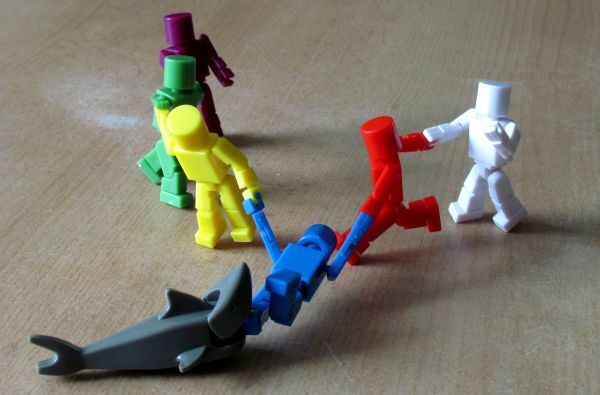 All five figures make a nice line with the shark at the very end. He waits for the ones, who stay behind, and has no reason for venturing into a swimming race against human opponents. I see right before my eyes a scene from any horror shark movie, with an abandoned character in the open sea, when he (or she) is suddenly withdrawn under the water surface. It is exactly what would happen to stragglers in the Get Bit race. But there is still sacrifice in form of only one part of the body. Chance of survival is still there. 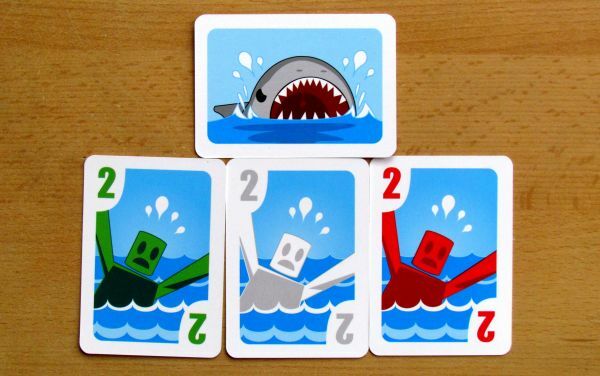 In each round, players play one card from their hand with a number on it, that determines, how fast the character swimms. 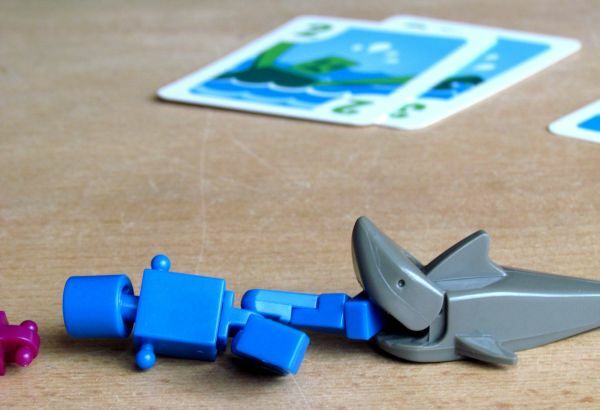 The higher the number, the greater speed and thus also chance for escape from the shark for this round. But only in the ideal case. Swimming speed is not everything, as we will talk a bit later. The card will play all first secretly and then simultaneously players reveal their choice. This determines the order of swimmers for this round. 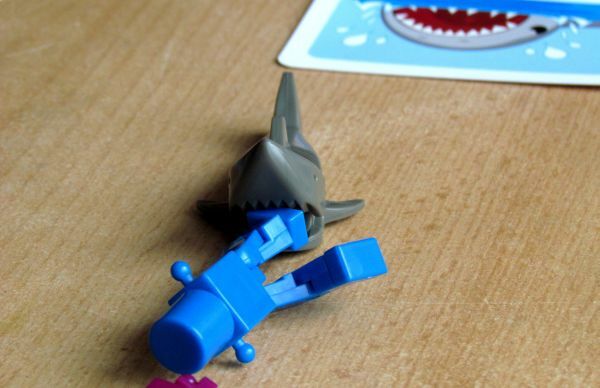 Now it is necessary to move forward with characters escape from the shark. Player, who played the lowest number, moves his pawn first and your swimmer moves up to first place. Then it is the second lowest number turn, and so on. This would be simple: a player should play the highest card possible to make sure, that he reaches the first place. But there are two buts. The first “but” is quite logical – your played card remains on the table until the one very moment, when you are able to take it back to your hand – when the predators jaws grip around your figure meat. Till then you will have more and more limited choice, but be sure, that your time will come! 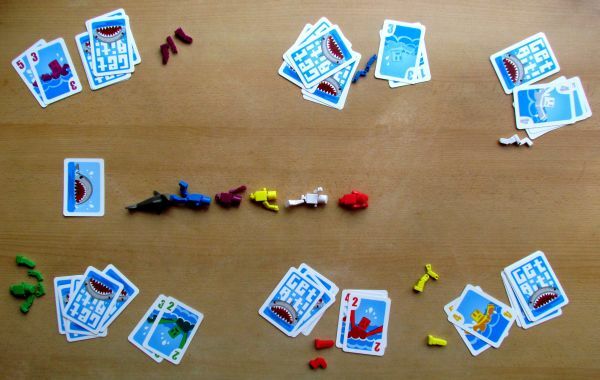 The second “but” is the most important of this game tweaks – if appear two same numbers on the table during one round, neither of swimmers moves forward! 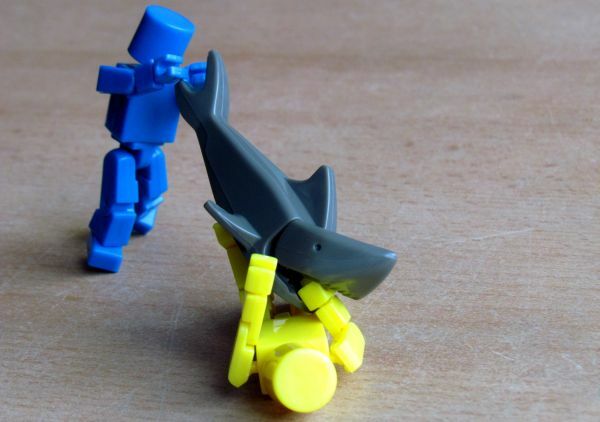 It follows a clear rule – the humans collided, while trying to swim away from the shark. The one, that was more behind in the previous round, will not escape those chattering teeth. Once the order is determined and all swimmers have moved (or not, in the case of a tie), then the last in line has to give up one of his body parts. 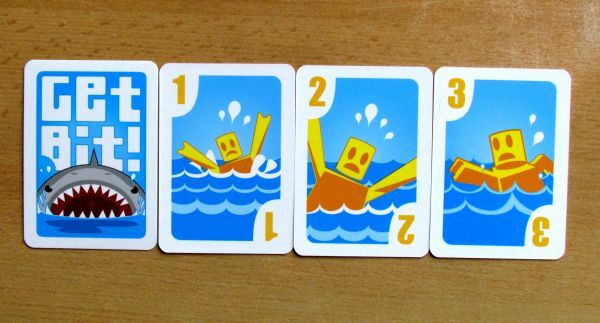 It can be hand or foot – each character has thus four lives, before the water finally closes over him. The only prize of consolation is, that now you can take back all the previously played cards. This prepares you a better starting position against rivals in the oncoming turn. So turns progress and finally one player drops out. When the time comes, there are only last two swimmers remaining in the contest, then that currently in the front prevails and is the winner. 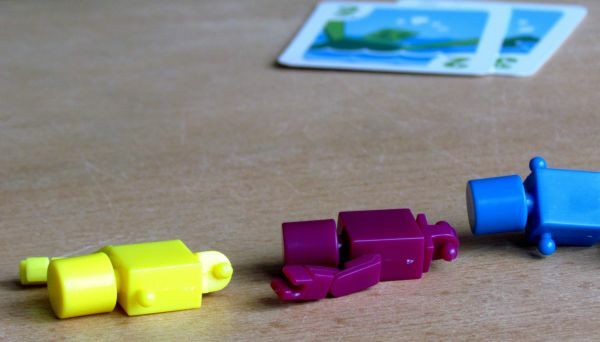 This game very smartly avoids accidental effect, that may occur in the end of the game. 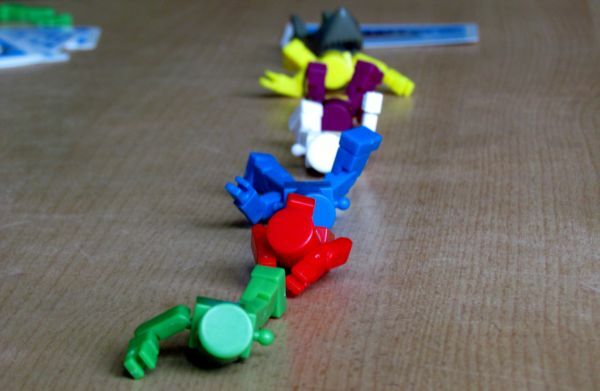 Players must carefully think through each move over, because it may be the last one. In that moment they will want to be completely up front. 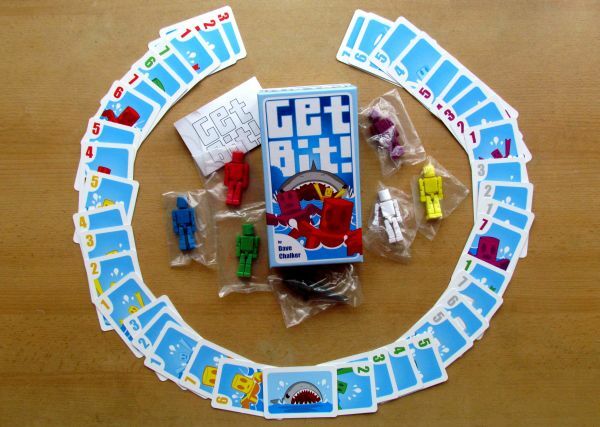 There is no sense in beating around the bush: Get Bit is really an excellent game. It handles perfectly its topic, with humour and ease. The depersonalization of miniatures is important, because even the more sensitive players do not mind the topic and fights are great fun. But there is more than meets the eye on this game. Nothing happens by accident or as a result of chance, it all depends only on you. How well you can read the thoughts and intentions of opponents. You have to sense the right moment to play a lower card and do not waste the high numbers at the beginning. The hand of cards will return to you later and ensures, that each swimmer gets his portion of bites. Although it may sometimes happen, that some of the characters escape from the entire game without a scratch! To do this, you need really big luck on his side and many well played ties. The overal principle is really simple and anyone can learn it in a minute. This game is also played fast, although it can be extended, if you want. 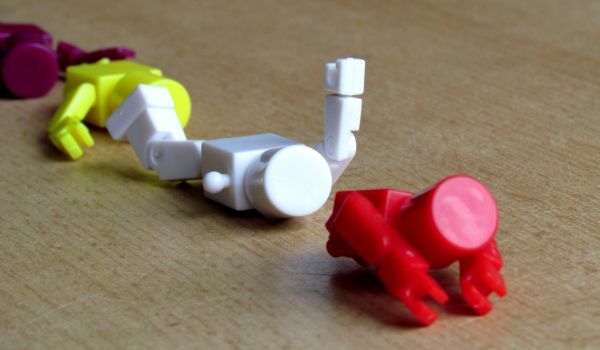 Miniatures have different joints in the limb divided into two parts now, right for this option. So it is up to you, if you bite off smaller or larger parts. The game also includes a variant for memory, when the played cards are not visible for all, but layed down on a pile instead. 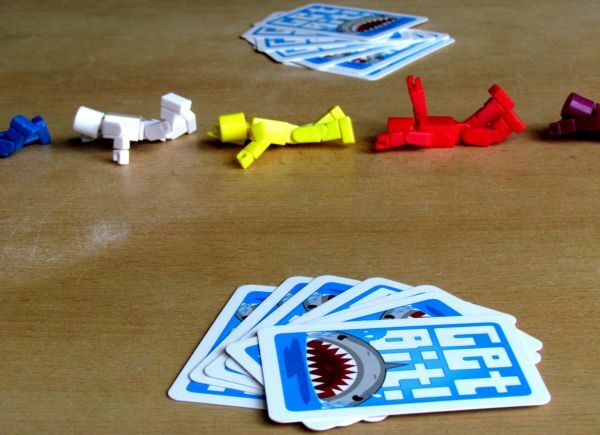 Although the Get Bit is a game recognizable at first glance as a party game, it can also be played with two players. 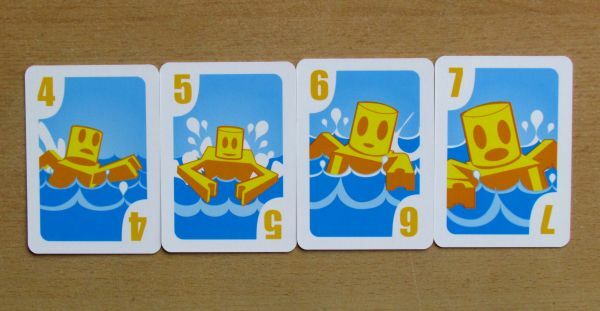 In this situation, however, each of players gets not one, but two swimmers instead and therefore also two decks of cards. Unlike the more complicated games, when this adjustment cancels player from his own thinking, here comes a completely different tactic. And it remains a great experience. You need to plan a little differently. 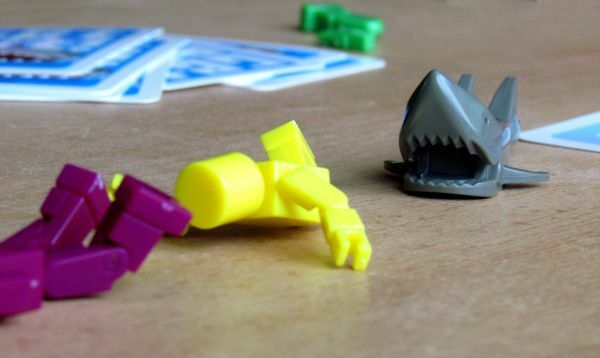 In addition, the game ends, when first swimmer drops out of the struggle for life, so again it ends very quickly. Some players might bet here on tactics to sacrifice one for another, but because four cards are always present in a round, you’ll enjoy also meeting tied states. 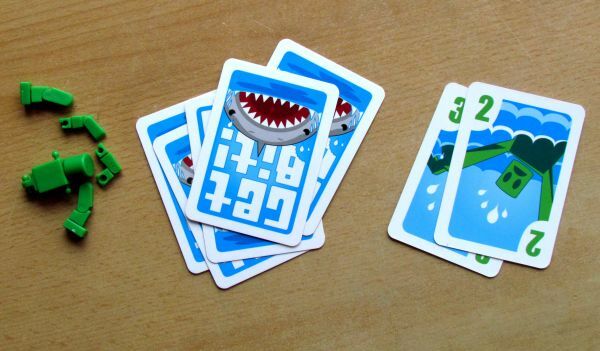 It is therefore clear, that Get Bit is fun for all numbers of players. Everything evolves around that secret oldschool playing of cards, which actually represents both a strategic and exciting moments. Illustrations and miniatures are excellent, no doubt about that. The cards have a simple drawings, colors are easily distinguishable from each other. 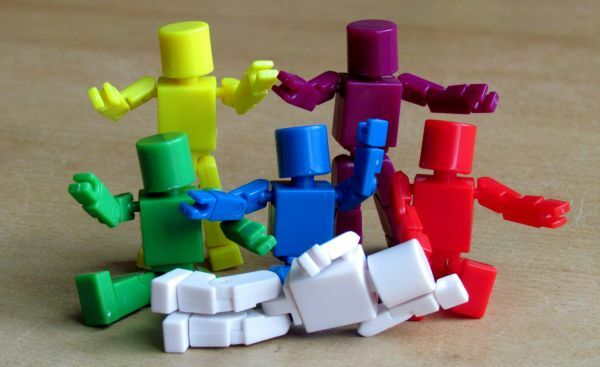 All new players glance will fall right down to those miniatures – they have all pretty flexible limbs and are elegantly disassemblied. We believe that even with more plays, this system does not wear out and will continue to work. 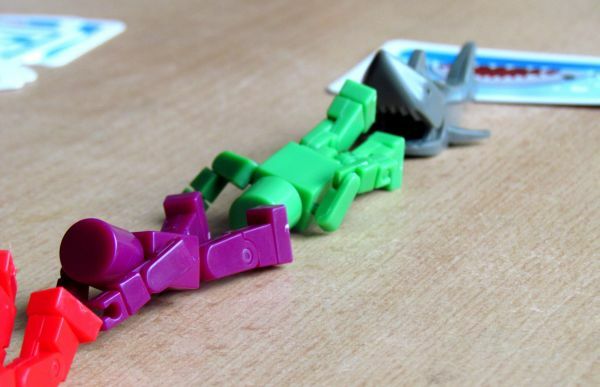 Get Bit is not a deep strategy game, but it serves great for what it was born. Because it provides a heap of fun and all o fit wrapped in really original jacket. Everything is handled with humor and you will get a lot of laughs. Still, in essence, it is a ruthless battle between all the players, who try to read each other mind. 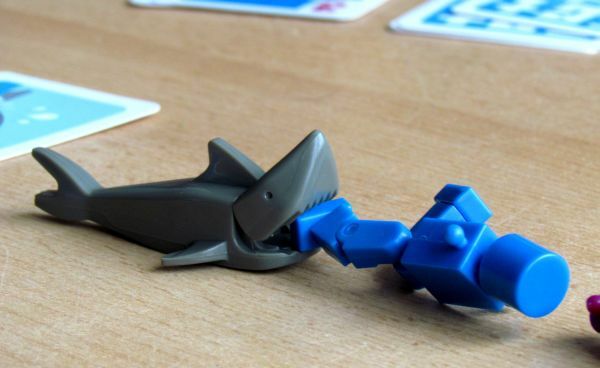 Feel free, and takes a bite out of this great game too! 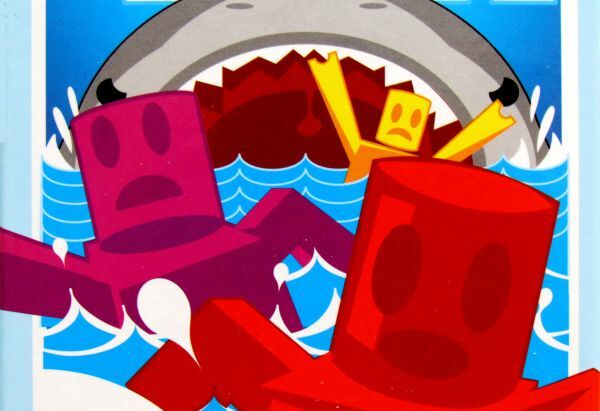 Get Bit is basically a simple game about swimming for your life. Up to six people will get stranded in water with a shark and no hope for rescue besides their own strength. It is up to you to keep them alive for as long as possible, waiting for a boat to float over and rescue you. You play numbered cards meaning the speed of your swimming. 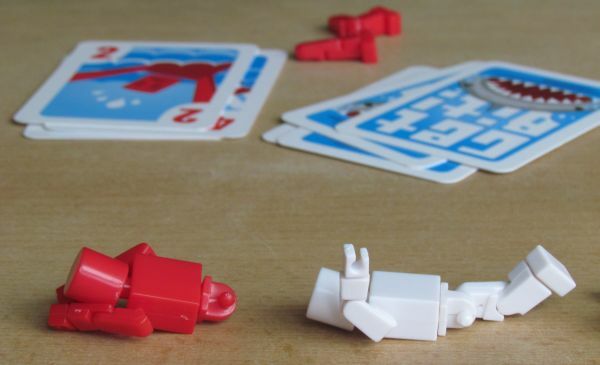 The one of the players, who will fall behind the most, will lose one of his limbs. This change will not be only imaginary, but you will really have to rip one of limbs of your swimmer miniature. They have great positionable legs and arms. 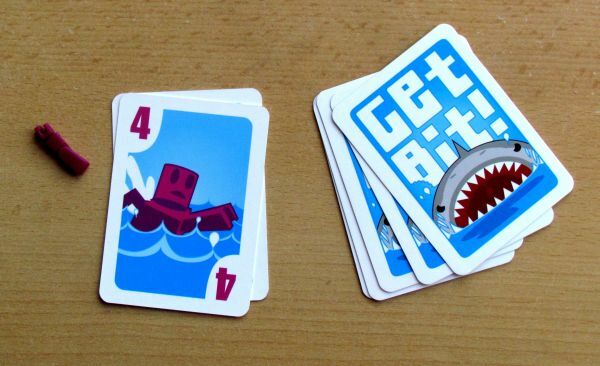 Get Bit offers lots of fun and thrills and also need for reading other players minds. 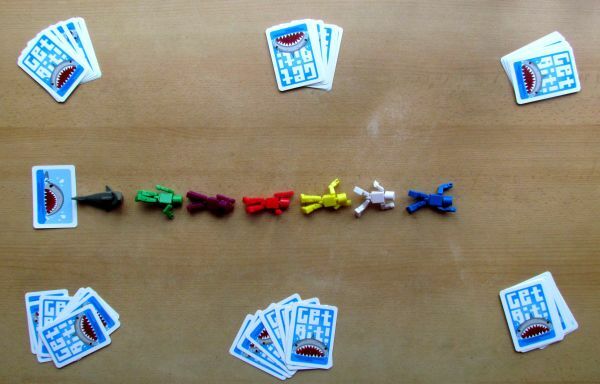 If you play same number as opponent, both of you will not move and shark will collect his reward. 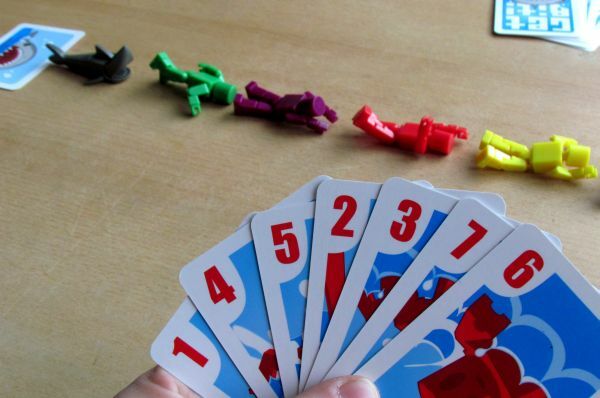 Match ends quite quickly and is great with any number of players possible. We can recommend this game to everybody, who likes untraditional games.